Sole Collector – "Life-Sized James Harden Gummy Shoes Are Now a Reality"
"This candy transformation was made a reality in concert with Chicago Culinary FX using a deconstructed pair of Harden Vol. 2s that Adidas provided prior to the shoe’s launch. 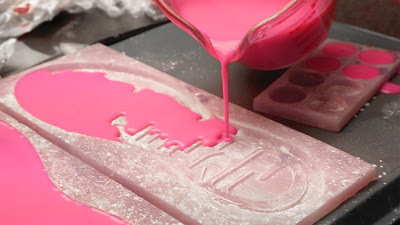 Custom molds were then created to produce an exact replica of the sneaker. The result is the 100 percent-edible Trolli x Adidas Harden Vol. 2 “SourStock” Edition, which now stands as the largest gummy ever produced by Trolli in the U.S. While the Sour Brite Sneaks are available at local 7-Eleven locations, the “SourStock” Vol. 2 will be quite a bit more exclusive. Just three pairs of the sneaker have been produced in three unique flavors: strawberry/blackberry, lemon/berry punch, lime/raspberry. Fans will have a chance to win one of the three pairs by entering a charity raffle on StockX that is now live and runs through Monday, March 26. Tickets are $5 each, and all proceeds benefit Harden’s 3 The Harden Way charity, a non-profit that supports Houston-area students with high achievements." 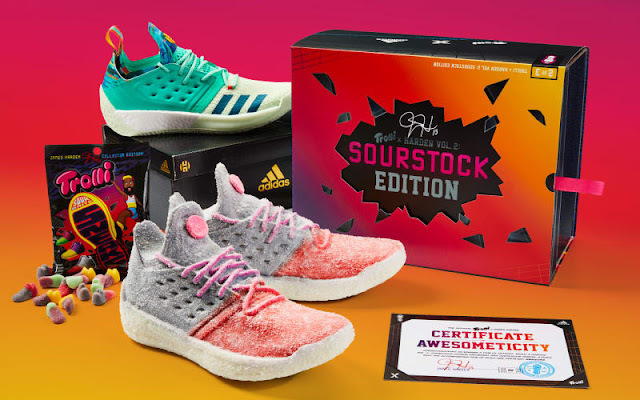 AdAge Creativity – "Trolli Just Dropped Giant Gummy Versions of James Harden's Sneakers"
""They weigh about six or seven pounds apiece," Periscope Creative Director Dustin Joyce says of the Trolli x Harden Vol. 2: SourStock Edition giant gummies. Each "shoe" includes the equivalent of roughly 90 servings of candy, he says." "... The Coming Fall of Man."